I have written before about the ways being stupid will cost you money, one of which was speeding. In reality there are many more ways to get a traffic ticket than just speeding and I happened to find out a new one of them. I was pulled over last week, not for speeding or texting while driving (please don’t ever do this!) but for neglecting to merge over, giving the officer on the side of the freeway a buffer lane…did you know that was law? Me either, but here are a few tips to avoid that costly ticket like I am happy to say I did this go around. I think one of biggest mistakes with previous traffic tickets was I was not prepared. I have always driven legally, license on hand, car insured and registered but I never kept good track of my registration or insurance cards. This just doesn’t look good and if the cop is going to give you any sort of a break, it will be here first before the traffic ticket. This time, I had all these things up to date and ready in the car. Take it easy, really. 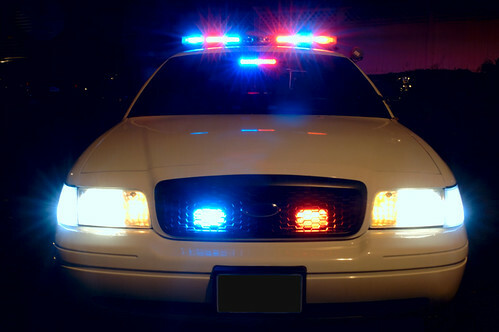 If the officer sees you moving around in the car, or acting odd, he or she will probably suspect something more serious than a simple traffic violation. This will cause two things to happen. First, the officer may be more on edge when coming to your window which rules out any chance you can sweet talk your way out of a ticket. Second and far worse, you may be suspected of hiding something and when you are asked to “step out of the car” that’s never a good sign. Honesty can go a long way in this situation. Police aren’t stupid and if you try to pull the wool over their eyes, you may just offend them and your chances of a warning ticket fly right out the window. Be honest about your situation, police are people too and may understand you were running a little late for your kids graduation and didn’t notice your speed, or you honestly didn’t see the speed limit change from 65 to 55. In my situation, I had no idea that what I was pulled over for was a law and I told the officer that, asking if it was a new law. He explained that it was new and was being heavily enforced to get the word out about it. If you aren’t let off on the ticket, don’t take it personally. You might just land yourself in more trouble if you are confrontational or show aggression towards the officer. It’s best to just let it go, and look into traffic school or a plea in abeyance to get the ticket wiped from your record. When I got my first traffic ticket, I was pretty upset so I did a bunch of research about ways to avoid getting a traffic ticket after being pulled over. Some of the ideas are pretty solid but some seem a bit too outlandish. I read suggestions to; turn your car off and set your car keys on your hood, visible to the officer; place both hands on your steering wheel. The suggestions I wouldn’t take include dropping your keys out of your window, wetting yourself and claiming you were rushing to the bathroom or faking other illness. These may get you off, but they may just get you in more trouble. Finally, I’ll leave you with a little story. Someone once told me of their friend that was driving the canyon roads and was speeding way over the speed limit. He got pulled over and when the office got up to the window of the car, he found a dog with it’s paws on the steering wheel and an older gentleman in the passenger seat, feigning sleep. The officer began to speak after a few minutes, and the old gentleman said, “I told that dang dog to slow down!” The officer laughed so hard, he could barely tell the guy he was letting him off with a warning. That just goes to show you, creativity can go a long way. I think sometimes if you are a positive energetic person (which you seem to be), that helps in avoiding ticket too! .-= Money Reasons´s last blog ..Are You Tracking Your Cash Flow? You’d Better Be! =-. Thanks MR, it’s funny because this is my fifth time being pulled over, and the first time I felt calm and knew I had everything with me in the car that I would need. I was just really talkative and sincere with the guy and he was nice enough to let me off, he even asked me to be careful as I pulled back onto the freeway, saying others don’t pay enough attention to merging vehicles, which threw me a bit as he seemed genuinely concerned with my safety. I actually tried it and got mine reduced. Not to just a warning, but only a $65 fine and no points. .-= Guy G.´s last blog ..Grocery Saving Tips â€“ Tips on Budgeting =-. Interesting, Guy, I had never heard that, but it certainly makes sense. I will have to try that next time which hopefully will be a long while off 🙂 What’s funny about this type of situation, now I know some more tips I want to try, but you never really want to be in a situation to try them..
1. Be a good-looking female. 2. Cry (and be a female). I can’t count the number of times female friends of mine have told me that got off with a warning. On the other hand, I’ve been pulled over nine times in my life and I have been given a warning exactly ONCE – and that was about four months ago (only because the cop was not in his jurisdiction when he pulled me over). I am always very polite to the officers and very cooperative too, so that hasn’t worked for me. Maybe I’ll have to start driving everywhere with my 115 pound dog – the discomfort of having him sit on my lap after I get pulled over will be worth it if it gets me off the hook! .-= Len Penzo´s last blog ..Expedia, Orbitz, Priceline and Others: What’s the Best Travel Search Engine? =-. Nice tips! My husband went through the police academy, and he knows the drill every time (it’s been several times) he gets pulled over. He turns off the car and puts the keys on the dashboard and has license and registration ready and in hand. He always talks to the officers and asks them if they know certain people (that he knew while working in the area) and we’ve never met a rude cop. He hasn’t ever gotten off with a warning, but in one case we didn’t have our updated registration in the car with us (it was on a desk at home) and the officer cited him for that rather than the speeding simply because we were nice and cooperative. I, on the other hand, have never been pulled over while I have been driving… *knock on wood* But at least I know what to do, after having been through it several times with my hubby. .-= Amanda´s last blog ..Recipe Thursday: Creamy Lemon Crumb Squares =-. Thanks Amanda, I had no idea your husband went through the acadamy? How come he didn’t join the force? I’m surprised that he hasn’t been let off though, being an inside man and all but good to know how it’s supposed to be done. I’ve been pulled over 4 times in my driving career and gotten 2 tickets, and two warnings. I was calm and courteous at all times, and I honestly think it helped me in getting 2 of stops only be warnings. The other two times I just paid the tickets and moved on because I WAS speeding, and I HAD gone through the stop sign I didn’t see.. *sigh. .-= Peter´s last blog ..7 Lies About Money That Can Kill Your Financial Future =-. Peter, I’d bet on those odds 🙂 You seem to have things down pretty good. My odds are 3/5 ticketed but I still claim entrapment on the second! Not many people know about the options to wipe tickets from your record either. I have 3 tickets but none on my record thanks to traffic school and plea in abeyance. A good rule of thumb is never go more than 5 over on normal roads and 10 over on highways. But if you are the only car on the road, maybe slow down a little more. The officer might have nothing better to do! Honesty works the best if you are pulled over. The only times I have ever been pulled over were when I was breaking my previous rule out of haste or ignorance of the speed limit. I always act genuine and just say, yeah sorry, I wasn’t paying attention. Maybe throw in, a “that was dumb”. I still have a “perfect record” too, which goes a long way when they do pull you over. Someone told me that if you have been pulled over with a warning within 3 months it shows up that you were warned and they will almost certainly give you a ticket. Not sure how true that is. Tech, great tips there. I usually cruise about 6 MPH over, on freeways, and zero on the streets. I heard a story about a cop that would pull people over even if they were only going 1 MPH over the speet limit on streets, so that always freaks me out. I also think the solo thing applies as well as the bored cops..don’t draw attention to yourself! About warnings, I’m not sure how long they stay, but they are recorded. I was told by the officer that let me off that if I was pulled over for the same thing again, I would certainly be ticketed for it. Now I’m curious how long those are recorded for..maybe Amanda’s husband can enlighten us. Thanks for stopping by, Tech! Fabulous story about the dog! Yeah, tickets are the unexpected certainty in my life unless I can figure out a way to stay home every day! .-= LeanLifeCoach´s last blog ..Combat The Closing Techniques â€“ The Reverse Psychology Close =-. I just heard about the new law where you have to switch lanes to allow a buffer lane. It’s so hard to know what new laws have been passed. Good thing he only gave you a warning! The only times I’ve ever been pulled over was 4 times within two weeks, when I was 16. I was even criminally speeding apparently (53 in a 25mph) and I got a warning. I didn’t realize the speed limit changed, and I was in a hurry, but I was honest and didn’t cry. I was really surprised. But I think those incidents set me straight! Now I never go more than 6 mph over! .-= Jaime @ Eventual Millionaire´s last blog ..How Do Young, Inexperienced, Poor Entrepreneurs Make a Million? =-. and thanks for your comments! Nice one! Reminds me to publish my own version of this, b/c I crap u not, I’ve been pulled over 3X in Moose, and got let go each time! .-= Financial Samurai´s last blog ..Don’t Have Children If You Can’t Take Care Of Yourself =-. Thanks for sharing these valuable tips on avoiding a traffic ticket. Not only will these tips help people to save money, but will also help them to save time. Sherrie Melton on Is Auto Assure a Scam? Sherrie Melton on Amazon Prime Review – Is It For You?